Humber, Coast and Vale Mental Health Partnership urges people in Hull and Humber complete a free suicide prevention online training programme, and improve support for those suffering from suicidal thoughts. The Humber, Coast and Vale Mental Health Partnership has launched the #TalkSuicide campaign to encourage people to complete a free 20-minute online suicide prevention training programme. The #TalkSuicide campaign urges people in Hull to visit www.talksuicide.co.uk to complete the video-based training, so they can learn life-saving skills and improve the support network for those struggling with suicidal thoughts. The Zero Suicide Alliance – a group of NHS Trusts, businesses and individuals committed to suicide prevention – has created the training to help people spot signs in people experiencing suicidal thoughts, and equip them with the information and skills to help them help these people. There were 5,821 registered suicides in the UK in 2017 – more than one death every two hours – with the Yorkshire and Humber region having some of the highest suicide rates in England. Mental health issues and financial problems are some of the biggest contributing factors to suicide. National statistics show that suicide is the biggest killer of men aged under 50. Men accounted for three quarters of suicides registered in 2017, while those aged between 45-49 are considered to be most at risk. Visit www.talksuicide.co.uk to complete the video-based suicide prevention training and learn more about the #TalkSuicide campaign. “Food sharing is a behaviour as old as time, but it’s something of a lost practice – we want to bring it back,” says Cara Bilson, Hull Market Maker for food sharing app OLIO. 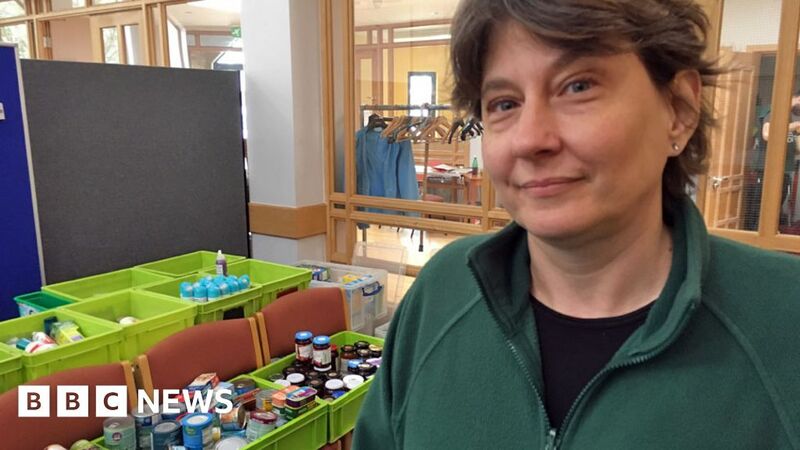 “Not only can food sharing help us in the fight against climate change, and help us to support families over the Christmas period, it can also help us to reconnect with our local communities,” Cara explains. In 2017 UK families were projected to spend £4.2 billion on food and drink in the week before Christmas (see The Guardian 12/12/2017), with approximately £1 billion worth of this food being thrown away. Cara adds: “While this waste occurs, hundreds & thousands of children will not wake up to Christmas presents – they will wake up hungry. Christmas is meant to be a time of joy, but for millions of families, it’s a time of stress, hunger and uncertainty. It doesn’t have to be this way. “Our food sharing app OLIO hopes to tackle the twin evils of hunger and food waste. It does this by connecting neighbours with each other, and volunteers with local shops, so that surplus food can be shared not thrown away. “I have been building the food sharing revolution in Hull for the last 6 months now and it’s been going from strength to strength. We have 4,190 users who have shared over 10,800 portions of food with each other! This is an amazing achievement, especially when you imagine that amount of food all in one room together, you can really envision the impact that OLIO is having. Help reduce waste, tackle hunger and build community in Hull this Christmas by downloading the free food sharing app OLIO. RHM is a registered charity, and has been working in Hull for about 7 years. Its mission is to restore people who are living chaotic lives, especially those in the grip of addiction and dependency, many of whom are homeless or living in the city’s hostels. Paul Linley, Director of RHM Hull. The charity is directed by Paul Linley, who has much experience of the needs of people in this sector. In the last couple of years the charity has established some very firm working relationships with other organisations. RHM oversees counselling to clients by accommodating student counsellor placements from East Riding College, some of these students have stayed with RHM as volunteer counsellors after qualifying. Selby Street Mission in west Hull now hosts RHM’s office and counselling space, providing additional support for visitors to the Mission’s food bank, drop-ins, and showering facilities. Finally, for homeless clients that are ready and actively engaging with recovery, RHM now works with the Methodist Church’s International House to offer a number of rooms in supported accommodation. This partnership-working approach is delivering numerous positive outcomes. The partnerships RHM has developed have given the charity a solid foundation, becoming a prominent provider of addiction recovery support in the city. The counselling placements have been key in allowing the charity to make such an impact on their clients. Initially RHM offered student counsellor placements to 3 people, but early success saw this number rise to 6 placements, and the clients are clearly benefitting. Lizzie Paterson was a student studying for a counselling qualification with East Riding College. She completed her required 100 placement hours with RHM, and is now a fully qualified counsellor. She has stayed with RHM, currently offering her counselling skills voluntarily to clients. She is passionate about continuing her work with the charity. The partnership with Selby Street Mission has also strengthened RHM’s work, the Mission has built an extra counselling room within the premises, and there are further plans for more refurbishment being explored too. Helping to direct the work of Selby Street Mission is Sue Trotter, one of a very small team of mission enablers volunteering with the Methodist Church to make this often overlooked part of the city a better place for residents to live. Few people can ‘get back on track’ without the stability of having a place they can call home, a place to feel safe and secure, in which they can be themselves, dealing with personal issues at their own pace, but with guidance and support. International House, another Methodist Church project in west Hull, now offers a small number of rooms to RHM clients, knowing that RHM will provide dedicated support to residents. We often hear that society is breaking down, and that communities are increasingly divided. To see joined-up working of this sort, by RHM and its partners, is refreshing. This partnership is providing a ‘road map’ out of despair for the people that they encounter. Each partner organisation also benefits, sharing skills and resources, reducing stress upon staff and volunteers, and sustaining their work despite increasing financial challenges. The issues and problems encountered in the homelessness sector will be answered by ‘solutions people’ such as these. Visitors to the World Homelessness Day event in Hull this week were the first to be introduced to Emmaus Hull and East Riding’s latest development – an ‘App’ for smartphones. The app has 2 main functions, to support the Street Outreach Team, and to help with the logistics of Emmaus’ social enterprise activities. The Locate Rough Sleeper section of the app contains a simple form, with the ability to pin your current GPS, designed to be quick and easy to use whilst ensuring Emmaus receive all of the information they need to dispatch a team member to offer support to a rough sleeper in Hull or the East Riding. The Donate Items section of the app will allow members of the public to request a collection of items they want to donate to Emmaus Hull & East Riding’s warehouse and shops. In this section of the smartphone app people donating items can even add photos of the goods they’re donating. This will allow the logistics team to accurately assess the time needed to process collections, maybe even avoiding wasted trips to look at items that the team cannot accept into the warehouse. Both sections of the app send information into Emmaus, and then a member of the Emmaus team will contact them. The app is not going to be replacing Emmaus’ friendly face-to-face way of working, it’ll just help to streamline operations on a day-to-day basis. The app also has internal access to news from the charity, and a link to HumberHelp for wider sector news and resources. The app is currently available for the Android operating system through Google’s PlayStore – search for Emmaus Hull. The iOS version of the app will be available from Apple’s AppStore within a week or so. HumberHelp: V2.0 – we’re refreshed! No better day than World Homelessness Day 2018 to reveal our new refreshed format, hope you like it – or at least get used to it quickly. HumberHelp has travelled a long way over the years. It was always designed from my own home computer, using desktop web design software. But, it got too BIG. It had become rather cumbersome to update and upload – maybe a victim of its own success. In this new, refreshed, format we’ll be able to upload content more easily, and even more quickly. Much of what we’ve written over the years has been scrapped, so apologies if some of the content you submitted has gone, nothing lasts for ever – it made a great impact in its moment, but I know from ‘analytics’ that older content was no longer getting the attention it once enjoyed. This new HumberHelp, call it V2.0 if you like, presents us with some great opportunities. We’ll be publishing more podcasts. Interviews with key sector figures both locally and nationally, and episodes covering themes and issues. Some of these podcast episodes will be recorded in front of a small audience, so look out for our events – they’re likely to be Friday afternoon gatherings at my studio or another convenient/relevant location. We also now have the opportunity to appoint ‘contributors’, those people and organisations that produce a steady stream of sector news and content. I’ll be approaching some of you to ask if you’d like to become a contributor. Contributors will be able to submit content to HumberHelp directly, pending moderation by me as editor. Chat with me if you’re interested in this. I know change can be challenging for some, but I hope you like the potential of this new format and the direction we’re going in. It’s always great to have your support, and your feedback is welcome too. “A national scandal”: 449 people died homeless in the last year. Please find below an article focusing on the work of the ‘Bureau of Investigative Journalism’ which has been undertaking a detailed piece of work to identify all those who die homeless and to tell their stories. Their activity has identified 449 deaths of homeless people in the last year but considers this to be an underestimate. Enabling Change – Richard McKinnon, CEO Humbercare, Hull. The homelessness sector in Hull is currently a volatile place to work, at least – it is for some. There is a small, but loud, movement of people expressing their distrust of local government commissioned services and established voluntary sector organisations. Social media is alive with keyboard activism, grabbed photos are shared as undisputed fact, vitriol accompanies video. Worryingly, the very people that need help – our city’s rough sleepers, sofa surfers, and those at acute risk of homelessness – are in danger of being influenced by this clamour, perhaps even avoiding services that could actually positively transform their lives. Despite this, remarkable outcomes are being achieved by those commissioned to deliver support. Richard McKinnon is CEO of Humbercare, where he has worked for 19 years. His involvement within the homelessness sector in Hull started much earlier. At 20 years of age, in his first job within the sector, he was a bank worker for the English Churches Housing Group. Before joining Humbercare he also spent time in employment with other homelessness and social housing organisations. At Stoneham Housing Association he worked with offenders being released from prison. For HullHARP he helped to deliver services at Dock House. He was part of the team that set up the Roper Street night shelter many years ago. Throughout his career in the sector he’s also encouraged partnership working, and has served on many Boards and advisory panels. Homelessness has changed a lot over the last few decades. Right to Buy has decreased council housing provision. House prices have risen dramatically, making even ‘affordable housing’ unattainable for some. More and more people are having to rent in the precarious ‘Private Rental Sector’. Rough sleeping has more than tripled in the city in the last decade alone. The funding of homelessness service provision, especially in the voluntary sector, is a very contentious issue for many. A common argument posed by those clamorous voices on social media is that no organisation or group, however constituted, should be seen to ‘profit’ from others’ misfortune and disadvantage. How services can become sustainable for their beneficiaries, and attract well qualified and experienced staff to generate the required outcomes, is often overlooked by such voices. I can attest to this. The certificates of compliance and evaluation from various scrutinising panels are displayed for all to see in the reception at Humbercare’s Head Office. It is the complexity of the service delivery, and the complexity of the people it serves, that sometimes results in incidents that attract negative comment and attention online. ‘Billy used to be homeless.’ A visit to Emmaus Hull and East Riding. By Mel Hewitt, December 2017. December has shown up again, the same time as it usually does – and bringing all things Christmas along with it. It gets its timing right each year as shoppers scurry in the cold, determined to exchange their monthly incomings into material outgoings that they then wrap up and give to their nearest and dearest – a sure token of their affection and adoration. We only have to take our blinkers off for a minute, though, and in-between the addictively twinkly shop windows of our high streets we see the evidence of our cities being polarised into ‘haves’ and ‘have-nots’. Dirty blankets, pots for change, agendas that have no space for anything but nourishment, warmth and the occasional “Can you spare some change please, love?” So for what it’s worth, reader, this Christmas, can I gift you a tale of Billy? Billy used to be homeless. He knows what it is to be a ‘have-not’ in a world addicted to Advent. He has slept on the streets, in hostels and in a prison cell. I am sure he is well-versed in his rattle for change and is highly skilled in catching the eye of a stranger, hurtling past, arms as full as sleighs will be. He also has academic qualifications in mechanics, the gift of the gab, a way of putting people at ease, and now a home at The Orchard – Hull’s Emmaus community. For those of you who don’t know what an Emmaus community is (or indeed that Hull had one) don’t worry – you’re in good company. Let’s start with the internet, then I’ll give you the feels. Emmaus, according to my pal Wiki, is “an international solidarity movement founded in Paris in 1949 by the Catholic priest Abbe Pierre to combat poverty and homelessness”. His picture hangs proudly in the Emmaus superstore on Lockwood Street where many of the companions live, work and participate in this thing we’re all collectively winging called life. Thirty companions can live and work there at any one time. Emmaus provides a home, a job, a place to socialise, learning and much more than that. It invests in people’s identities and provides them with not only physical safety inside its roof and walls, but an environment fit for purpose with its wraparound care. Billy put it much more eloquently than I ever could with his definition simply being “Freedom”. The superstore is vast, with every conceivable item of donated furniture on display; all cleaned, some upcycled and ready to find a new home. I eyed up a chair that would have sat perfectly in my hallway if only I knew the size of the space to fill. It could wait. I knew I’d be coming back. Billy tells me the importance of the daily morning meetings, sorting what needs sorting, airing views that need sharing and allocating a key holder for when everyone else goes to their home and the companions are left to manage themselves. A brilliant way for companions to be heard and participate is having their own daily planning meeting. Integration and self-empowerment are key themes that seem to underpin everything that goes on here. I could almost feel it. The companions manage themselves domestically and do this successfully. Rotas line one noticeboard – kitchen, cleaning, laundry – and everyone does their bit to keep the wheel turning. Next I met their dog – because why shouldn’t a ‘family’ and ‘community’ have a pet? These folk seem to think outside the box with every available opportunity and make a success out of it. For gardeners there is an allotment and a decent whack of green space. For those who aren’t gardeners, I have a feeling they may have a go. More than once I heard that once someone starts tinkering about with something at The Orchard, others quickly follow suit, constantly belting out those values of involvement, acceptance and skill-sharing. I saw it in action wherever I walked. Someone outside planing wood attracts another companion without realising it, and then there are two. Someone making Christmas trees for the new shop on Whitefriargate is soon joined by another face; a companion working the till for the first time is supported by another. Old skills are rebirthed, new skills are embraced and formal qualifications are achieved. I was quickly becoming The Orchard’s biggest fan. We walked through to the companions’ entrance and Billy told me of his fears when he had first arrived and sat in the armchair in the lobby. Was it a cult? He soon found out it wasn’t. Would it be like prison? Another qualm quickly quashed. Interestingly, Billy used to live in Hull as a child but held little memories of it until he returned. When he did he surprised himself by knowing how to get around on autopilot because “most things haven’t changed – the streets remained the same”. Two things really stood out to my wandering eyes. Firstly, I spied on top of his wardrobe a pile of criminology textbooks. He was taking some steps to alter his own path while still having a tag in situ – a most uplifting juxtaposition, showing that this ‘have-not’ had decided it was time he ‘had’. Secondly, he had previously told me that his room was round the front. Now, he pointed to his curtains as he told me that he always sleeps with them open. A stargazer by default is what I’d instinctively presumed, but poetic instincts can be silenced as romantic and clichéd. “It’s because I’m nosy. I like to know what’s going on.” From one curtain-twitcher to another – this not only was the perfect answer, but also highlighted yet again that if we strip away our labels and limitations, we are all basically the same. I loved the fact that there was also a guest room for companions’ friends and family to visit. Why shouldn’t they be afforded the right to rebuild kinship and social ties? We went down to the Apple Tree Café where I shook Billy’s hand firmly and thanked him for taking time out of his busy working day to satisfy my curiosity. Much has been expressed recently in the national and local media about the issue of rough-sleeping and homelessness in Hull, some of it ill-informed, much of it untrue and a lot of it discriminatory. I really wanted to find out more about the Rough Sleeper Outreach Support Team, which is another side to the work done at The Orchard. Unfortunately after an incredibly busy night, when staff returned to base, their time was hijacked by having to provide a media response. The media wanted to know what this team of people were doing to solve the problem of rough sleepers in Hull. The irony of this astounded me. They were actually stopped doing their invaluable work, gaining trust with rough sleepers, finding well-thought-out solutions and working flat-out, to answer the question, “How are you solving this?” It was obvious as an outsider that they were doing every possible thing they could and doing it superbly. A cuppa at the Apple Tree Café ended my visit. I had actually heard more about the café than anything else before I came on this journey. I know people who go out of their way to eat, greet and socialise there and I completely understood why now. The whole place has a vibe that is drenched in positive energy. People aren’t judged or labelled, it hollers equality, empowerment and encouragement so loudly it’s hard not to hear it. The Orchard’s doors are wide open and welcoming. Yes, I like happy endings and positivity and I invariably try to draw them into my peripheral vision wherever I am. The Orchard gave me this without having to go looking too hard at all. Just to top off what was a fantastic morning, someone began playing a beautiful melody on the piano. When I asked who he was, I heard he was a neighbour who often pops by. How perfect – social integration at its finest happening in front of me. So, this Christmas I will not be sending cards to my nearest, dearest and those in-between; I shall donate what I would have spent to Emmaus Hull. It is in very good hands with them. I wish them nothing but new beginnings, happy endings and a peaceful family Christmas. And Billy? I wish him everything he wishes for himself.